This strain has been mislabeled as albino Red OB zebra for some years now.It is not a Albino but Hypo ( Hypomelanistic ). The eyes are dark wine red and look normal most of the time. In the Pic's the look bright red but in person they are a dark wine red. I always felt this strain was hypo and not albino but I had no proof until this year when I found the farm where this mutation was first discovered. The blue blotches and dark wine red eyes was a key marker for this gene. In a true albino the blotches would have been pink to a super light blue sheen. The proof was when the farm sent me some light brown fish with red eyes from this strain. I crossed a OB male from this strain to some Cherry red zebra females and bred the young back to another male from this strain and got a few light brown fish with the wine red eyes. There was all the proof I needed. A albino would have been white or cream colored. I been working with this line for a few years now crossing them into Cherry Red females increasing the orange background color. This male is a result of those breeding's. Never have understood why people can't just be happy with the thousands of natural cichlids in the world and quit making their own. Micheal wrote: Never have understood why people can't just be happy with the thousands of natural cichlids in the world and quit making their own. #1 it is fun to work with Genetics. 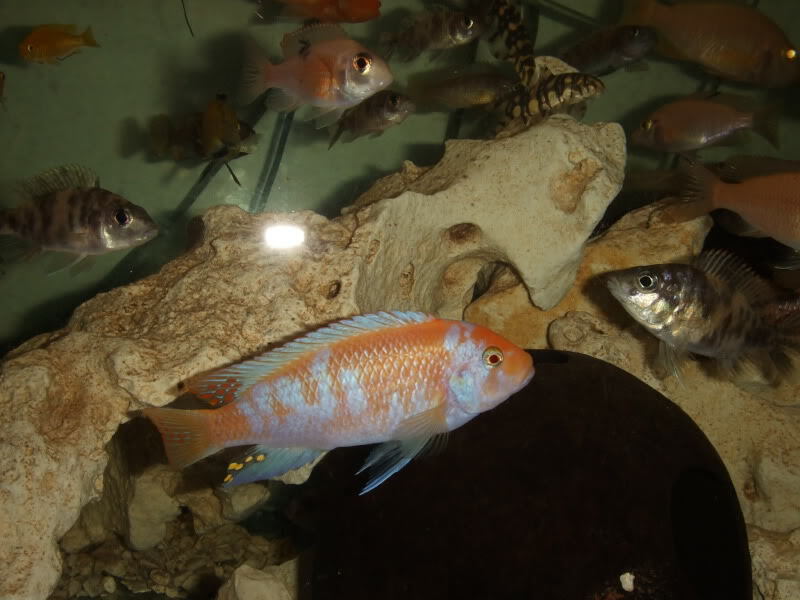 #3 You cant get all the cichlids that occor naturaly do to them being protited to collect by law or in areas too dangerous to collect them. There a a lot of different mutations to work with even in pure speices. This fish is a hybrid before I started working with it. the fact it is called a red OB is the kicker because there is very little red zebra in it. That is why I'm breeding cherry reds to the strain to make iot more like a red zebra . Cherry red zebras is a line bred hybrid and blows away the pure esterae when it comes to color. I'm also breeding a true red OB estherae. BTW the peacock in your avatar pic are you sure it is a pure breed. I know it has yellow collar in it but unless you got it wild and off a repubule importer or a honestbreeder who gets there fish from a honest importer you have know idea of it being a pue peacock. Most Malawi fish in the hobby are hybirds. Vin, that's just it... Because people are breeding irresponsibly and selling the offspring it makes it that much more difficult for people to know what they actually have. Rift_Lakes_Rule wrote: Vin, that's just it... Because people are breeding irresponsibly and selling the offspring it makes it that much more difficult for people to know what they actually have. I agree on that point but as you know pandoras box is so open you cant go back. I used to be just a purist. Now I do both. When it comes down to it a pretty fish is a pretty fish. I have both pure and hybrid fish . I paied 300 bucks for 3 pr of wild yellow labs from Lions Cove. I always wanted a Fort Mc guire Red sholder peacock thast was at least 3/4 red . Now with the super Ruby Red peacock why would I want to go through all that work when I can just buy the super ruby red peacock that is a hybrid and blows away any Fort Maguire red sholder peacock.. i still love the Fort Mc guire buit I only have room for one not both and the super ruby is just a better looking fish. Cool looking fish you have there. 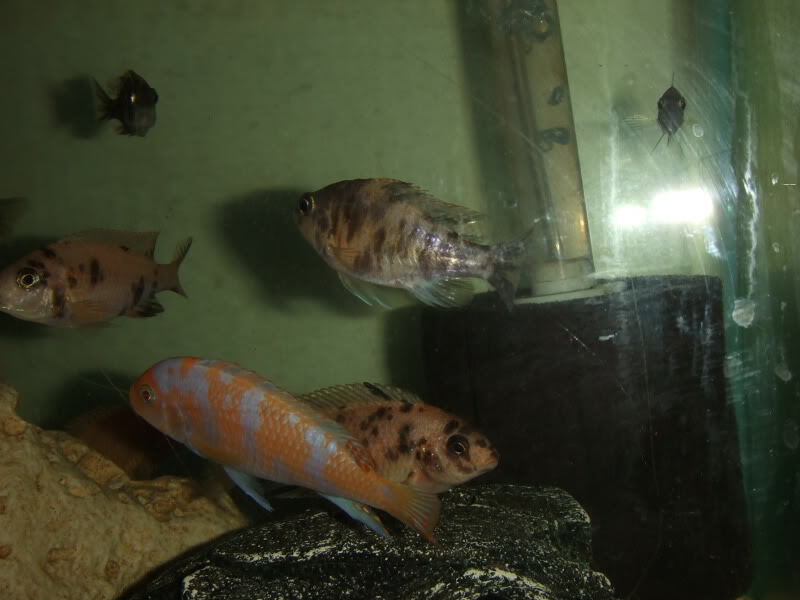 The Aulonocara ruby red is not a hybrid if it´s the same fish that we have here in Sweden. It´s a line breed from Aulonocara sp. "stuartgranti maleri" Chidunga Rocks. 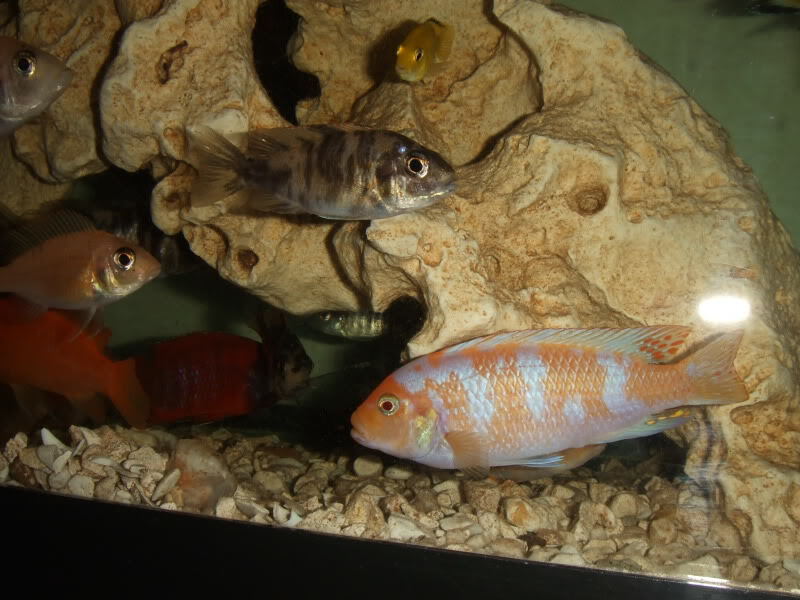 We also have one that´s called Aulonocara "eureka". A line breed from Aulonocara jacobfrebergi, Otter Point. Vinman I am not going to say that I agree with your motives for making hybrids but I will also respect you for the fact that you do not try to sell hybrids as pure breed fish. I understand there is a market for pretty fish and some people don't care if they are naturally occurring or not. I on the other hand would rather spend my efforts trying to help preserve a fish on the CARES list. That's the good thing about fish keeping though is you have many types of fish keepers and many types of fish to keep. Most all of my fish come from Cichlids and Herps or a breeder who buys from them so I feel pretty confident about the bloodlines of my fish.